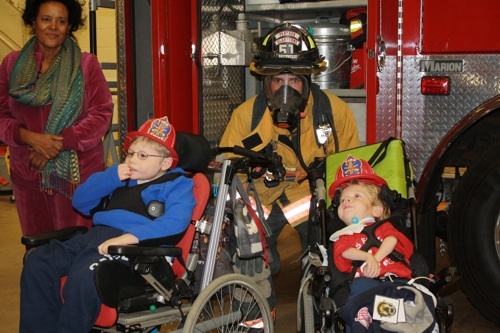 Volunteer firefighter Thompson Ross, fully outfitted as if he were getting ready to fight a fire, visits with Matheny students Nicholas Barros, left, and Jack Harter. Ross, a Peapack-Gladstone resident, is an emergency medical technician (EMT) in Cedar Knolls, NJ. At left is Matheny personal care assistant Mulualem Yihune. Elementary students at the Matheny School have been learning about fire safety and firefighters. So, when the Peapack-Gladstone volunteer Fire Department invited us to bring some of the students to the station for a visit, it was not only fun, but a real learning experience as well. P-G Chief of Police Greg Skinner, who is also a volunteer firefighter, demonstrated several pieces of equipment, introduced some of his fellow volunteers and explained that the class could be interrupted at any time if the alarm went off, signaling a real fire in the twin boroughs. The fire department visit is an example of how skills and behaviors learned in the classroom are practiced during interactive trips to various community resources. We’re very grateful to the Peapack-Gladstone volunteer firefighters who made time to spend time with our students. Matheny teacher Karen Dakak uses an iPad to help Nicholas Barros see some of the equipment better. This entry was posted in Uncategorized and tagged fire safety, firefighters. Bookmark the permalink. I would like to say thankyou to the volunteer fire fighters for inviting this class to learn what firefighters do, I heard all about the trip and the childrens reactions. Also, Thank you to Teacher Karen Dakak, for all you do in work and in life to help others! !